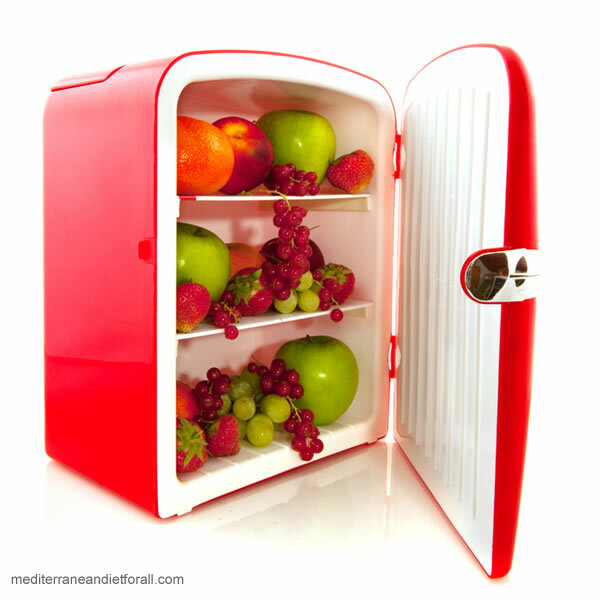 We have all heard that the Mediterranean diet is one of the healthiest diets to follow. Research has shown that following the principles outlined in this diet can greatly reduce risk of diseases such as Cardiac disease, some cancers, Type 2 Diabetes, Alzheimer’s and Parkinson’s. It has also shown success as a weight loss diet. Not only this but it is not a restrictive, complicated diet to follow, people living on the Mediterranean coast have been following this style of eating for years and the benefits are visible in their lower rates of chronic disease and longer life span. So how can the average American adopt a Mediterranean style eating pattern and benefit from the effects on health and wellbeing? The answer may be as simple as swapping some foods in your diet for ones that fit better into the Mediterranean style of eating. Simple changes in your diet can see drastic reductions in your intake of unhealthy saturated fats and sodium, as well as increases in heart healthy unsaturated and omega three fats, antioxidants, fibre and essential vitamins. Even if you start with small changes, you are well on the way to a healthier body and lifestyle if you are taking the steps towards a Mediterranean diet. The Med diet is based on a high intake of vegetables, fruit, beans and legumes, with at least two meals per week featuring poultry or high Omega 3 fish. Dairy and eggs are also eaten, but in smaller quantities than in the average American diet, and red meat, saturated fats and salt are eating sparingly. Olive oil is the main fat source, and along with red wine contributes antioxidants to the diet. What steps can we take to change out diet to a more Mediterranean style? It is well known that saturated fats contribute to the risk for heart disease and other lifestyle diseases. By eliminating foods like butter from your diet, you not only remove this source of saturated fat, but also introduce healthy unsaturated fats and antioxidants in the form of olive oil. A good quality Extra Virgin olive oil has fantastic flavour and can be used on bread, as a salad dressing. Don’t be afraid to use it in cooking too, contrary to popular belief olive oil can be used to cook at high temperatures, as the smoke point is 410˚ Fahrenheit, far higher than that needed for most frying. Choose a milder flavoured olive oil and it can even be used as a butter substitute in baking, producing a surprisingly moist cake. Other vegetable oils such as canola are also a good alternative, but are generally not as high in antioxidants as olive oils. Reduce red meat intake to a few times a month and replace with fish, poultry or legumes. Red meat is also a source of saturated fat and is best eaten sparingly. The typical American diet not only features red meat on a regular basis, but also in excessively large portions. When you do eat red meat, the portions should be about the size and thickness of a pack of playing cards. This is supported by data from The Mayo clinic which found that people who didn’t eat meat not only had lower risk of heart disease but were also less likely to be overweight. Instead of red meat try to increase your intake of fish (oily types contain the most Omega 3s), such as salmon, sardines, mackerel or tuna. If getting fresh fish is difficult it’s perfectly OK to buy frozen fillets or reduced salt tinned fish in olive oil or spring water. Poultry is also good as a meat substitute, but remove the skin and go for steamed or grilled options rather that a bucket of KFC. The Med diet also emphasizes a high intake of legumes such as lentils, dried beans and chickpeas. These are good sources of protein and fibre as well as vitamins, so try to go ‘vego’ from time to time and base your meal around these sources rather than animal products. Throw a handful of pre-cooked lentils into a soup, or whip up a tasty humus dip with a jar of chickpeas. Nuts are also a good protein source and rich in healthy fats and minerals such as potassium and calcium. They make an excellent Mediterranean style snack, but always choose unsalted varieties and stick to a small handful, particularly if you are trying to lose weight, as they are high in calories. Switch refined carbohydrates for whole grain. Whole grains provide an excellent source of fibre, protein and a variety of nutrients to the body. They are also low GI, which means they break down more slowly in the body and cause a slower rise in blood sugar levels, unlike refined carbohydrates which cause a rapid increase, then a sharp drop, leaving you feeling hungry again sooner. Substitute white bread ,pasta and rice for whole grain or brown varieties and choose a breakfast cereal based on whole grains, nuts and fruits, such as muesli rather than a high sugar variety. Go to your local health food store and see what grains they have to offer. You can create your own high fibre wholegrain cereal or add a handful or LSA (linseed, soy and almond) to a smoothie or in baking to bump up fibre and healthy fats. Try to substitute white flour for wholemeal in cooking and baking too, chances are you won’t even notice the difference. Add flavour with herbs and spices rather than salt. Salt is thought to be a contributor to high blood pressure and is a possible risk factor for heart disease and stomach cancer. The typical American diet is very high is salt, mainly due to a high consumption of processed foods. By using spices and herbs to enhance the flavour of foods, you can at least eliminate the need for salt in cooking or to add it at the table. Dried herbs are sufficient, but to add even more flavour, grow yourself a few herbs and have fresh ones on hand at all times. It’s amazing what a sprinkling of fresh coriander and a dash of lemon juice will do for a piece of fish! Swap processed foods for fresh alternatives. The American diet is incredibly high in processed foods, meaning many Americans have a huge intake of salt, saturated fats and sugar, not to mention chemicals, flavours and additives that are commonly found in these foods. Try to base your diet around fresh, non processed foods as in the Mediterranean diet. This can be difficult in a world when many people are incredibly busy and find it quicker to just grab a take away or microwave meal. By planning your meals for a week and shopping for fresh ingredients once a week you can make sure your diet is in line with the Mediterranean style and also ensure you minimize waste. Invest in a quick meal cookbook, it is possible to make a healthy meal in half an hour if you are organized. Remember, if you need to resort to frozen vegetables on occasion that’s fine, they are often even higher in nutrients as they are frozen immediately after picking, unlike some fresh sources which may have been sitting on supermarket shelves for weeks. While it must be stressed that if you don’t drink alcohol already you don’t need to take up the habit, if you are fond of the odd alcoholic beverage try to make it red wine. Red wine is packed full of antioxidants that are beneficial for the heart, so the occasional glass may well do you some good. Remember to have at least two alcohol free days a week and stick to the guidelines of one standard drink per day for women and two for men. Dairy products, while packed with important nutrients such as calcium are high in saturated fats. Therefore it is in your best interest to switch to low fat versions milk, yoghurt and cheese. Milk products do feature in the Mediterranean diet, think of all those lovely Greek yoghurt s and cheeses, but in moderation, and not as the main part of a meal. The Med diet, unlike the average American diet is low in refined sugars. Substitute sugary snacks with fresh fruit for your sweet hit, along with a load of vitamins and fibre. Dried fruit is also packed full of vitamins, but watch portion sizes as this is an easy way to consume a lot of calories. You wouldn’t normally eat five fresh apricots, but you could easily eat ten dried halves without a second thought. The Med diet is not just a diet, but also a lifestyle. In the Mediterranean, families traditionally sit down together and eat a relaxed meal. This is a far cry from most Americans, most of whom eat in the car, in front of the TV or at an office desk. By focusing on your meal times and the food you are eating you are less likely to overeat, more likely to be aware of the food you are putting into your body and setting a good example to other family members. Make these changes now to feel the benefits of the Mediterranean Diet. The Mediterranean diet is not a complicated one to follow, and by making the simple changes and adaptations to your eating habits above , you too can experience the amazing health benefits this style of eating has to offer.